Pert's statement on ASADA sanctions CEO Gary Pert has addressed supporters regarding Josh Thomas and Lachlan Keeffe's decision to not contest the ASADA findings. Lachlan Keeffe leaves the Westpac Centre following Monday's press conference. Keeffe: "We deeply regret our actions"
Thomas: "We apologise for the pain"
Collingwood players Lachlan Keeffe and Josh Thomas have accepted two-year bans after testing positive to banned substance clenbuterol. The Pies pair will be delisted and have been fined about $50,000 each – with part of their 2015 player payments to be withheld, as required by the AFL and the World Anti-Doping Authority. Keeffe and Thomas, who have been provisionally suspended since their positive A-sample result in March, will not be eligible to return to AFL until the 2017 season. The Magpies have committed to re-drafting the duo as rookies later this year, should they choose to nominate and are not selected by a rival club first. VIDEO: Watch CEO Gary Pert address the club's members and supporters about its stance on Keeffe and Thomas' suspensions. Reading prepared statements at a press conference on Monday, Keeffe and Thomas said they believed the banned substance found its way into their systems after they took illicit drugs during a night out. "While we are unable to be absolutely certain how this substance came to be in our system, we can only assume it occurred during a night out (in February) prior to testing in which we took illicit drugs," Thomas, 23, said. "Although we can't be sure, we believe the substance we took was laced with clenbuterol." The pair stressed they did not knowingly take the performance-enhancing drug. 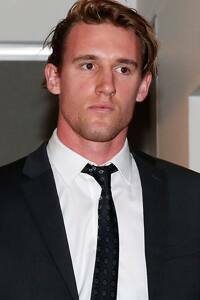 Keeffe, 25, hoped his and Thomas' mistakes didn't become "a life sentence" and said they wanted to return to AFL ranks in 2017. "The past few months have been really hard not to play football for the club that gave us that opportunity as teenagers," Keeffe said. "We deeply regret our actions, we take full responsibility for our mistakes and we accept the consequences. "We also hope others will learn from our mistakes. "We also hope that an error of judgement does not become a life sentence. "Having worked so hard to build AFL careers, we are now committed to starting again and we hope to regain everyone's faith and trust and return to the AFL in 2017." Magpies football boss Neil Balme said the club wanted to offer Thomas and Keeffe the opportunity to come back to the club as rookies to keep the "light at the end of the tunnel". Collingwood CEO Gary Pert conceded it would not be ideal to carry the pair on the rookie list, but the Pies' board made the decision in conjunction with the list management team. He said the pair wanted to "redeem themselves" by making it back into the AFL. Pert said he hoped the plight of the players acted as a warning to other athletes in Australia about the dangers of taking an illicit substance not knowing what it contains. "We accept that Josh and Lachie did not intentionally take performance-enhancing drugs and did not knowingly consume clenbuterol," Pert said. "We accept that this was a case of two young men who made a poor decision to consume illicit drugs – decisions they will regret for the rest of their lives. "Their decisions will cost them two years of AFL football … it will ultimately cost them hundres of thousands of dollars and definitely damage their reputations. "Our commitment to re-draft them says much about the regard that we have for them." Keeffe and Thomas will now participate in targeted drug-testing programs. Pert said the episode showed that the AFL's Illicit Drug Policy – voluntary agreed to by players – needed to be overhauled. "I want to see a policy that we're all happy with," Pert said. “For the clubs, the players, the players’ association, the AFL – everyone’s happy with. Right at the moment I think the players and the players' association are happy with it. "We certainly aren't and I don't think it's getting the results."